Mar joined Signaturit in June 2015, when there were only 6 people on the team. There was so much to do in the beginning that she was very eager to get started. From there on, she has been firing away on her keyboard. 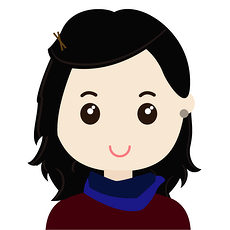 Besides being interested in marketing, she likes art, design and technology. In what others see an “ugly old couch”, she sees as a unique piece of furniture to restore. When she is not in the office, you can find her at the check-in desk in Barcelona’s airport - always ready to travel! If you want to know more about lovely Mar, you can follow her on Linkedin and Twitter, but don't miss her interview in this post. Through itnig venture builder, where I worked from late 2012 to mid 2015. At itnig I was responsible for various communication tasks (blog, newsletter, PR), social media and I was also organizing and managing events. While at itnig I met many people in Barcelona’s entrepreneurial world, so I was well aware of the job opportunities that came up in other startups. I discovered that Signaturit had an Inbound Marketing Manager position open in a moment that I was thinking of a professional change, towards a position focused on content marketing. I sent my CV, had an interview, and in June 2015 I began to work in Signaturit. Interesting and intense. Although we are very focused on content creation and management to cover all phases of the conversion funnel - tofu, mofu and bofu - we are also dealing with many other tasks to capture even more leads, and improve client conversion and retention. From how to improve our on-page and off-page SEO, how to combine newsletters and email marketing campaigns, how to optimize landing pages and content download forms, how to improve the web copy, maintain consistency among all languages, how to combine social media strategies with online publicity strategies, how to increasingly improve our ideal customer profile and buyer personas, and a ton of other stuff. Complementing the answer of the previous question, the general purpose of my job is to get to know our clients a bit better every day to offer them quality content that contributes to their loyalty. And knowing better who is interested in our services and why, also helps us improve our strategies for acquiring leads and converting them into customers. It all forms part of my job’s general goals..
Knowing our clients better we know what are their pain points, and the reasons why they finally decide to purchase our services - the electronic signature, certified email and electronic identification. In this way we have more information on our ideal customer profile, we increasingly know more about who needs our services within each sector and type of company, and we know who makes the decisions about it. In B2B businesses many people are involved in deciding what type of product or service to incorporate, why, when and how. 4. What do you like most about working in the Marketing Department? What I like most is that you can always be testing and experimenting with new strategies, tactics and actions to discover what works best to capture leads and increase conversions in your business. And once you have discovered something that works, you can always tweak it to improve that strategy, tactic or action even more. In B2B software marketing there is still so much to explore and to learn. And I love that. Everyday is different, although the goal is always the same: to know our clients better and to improve our acquisition, conversion and loyalty strategies. What I always do when I arrive is check my to-do list, to see what I have pending. I also review what was my priority yesterday, because maybe today it's not a priority. We always plan the work weeks in the marketing department, but we don’t follow plans strictly. Instead, we adapt each day at work according to things that come up, and we adjust our plans accordingly. At the end, what’s important is to have clear goals. The confidence, flexibility and the team that we have. The confidence in my ability and in that of my colleagues to do our job. In Signaturit, micromanagement does not exist. The flexibility regarding schedules, which I consider important to integrate my professional and personal life well. We have many challenges ahead, but at the team level I would highlight the need to improve communication between the marketing, sales and customer success departments. And I also believe that it is necessary to include the product team in our conversations. We all need to have the knowledge and insights from every department in order to work together in the same direction and rhythm. Without the information on our clients, information the sales and customer success departments especially have, it's practically impossible for marketing to do our job well. At an individual level, my main challenge is to keep up on new trends and strategies in digital marketing, and to update my knowledge constantly, especially with what is going on in B2B software marketing. There is a lot of information online, but you have to know how to filter and select well to not be confused with so much content. And then, of course, to detect what strategies could be used in Signaturit and how we could put them into practice. What I love is that we are very up to date with technological trends. On one hand, due to the fact that we won the second phase of the the EU’s Horizon2020 program, we will develop a blockchain project. And I really like to read up on this topic and be updated on the changes that will arise due to this technology, which looks like a revolution similar to when the Internet became mainstream. And on the other hand, because our clients belong to different verticals - insurers, banks and financial entities, HR companies and departments, etc. - that means we also have to be informed on the changes that technology is causing in these sectors. We have to understand in what processes our solution provides more value, to be able to explain it to our potential clients. I love being informed about all of this. Signabuddies are restless people, constant learners, and people who like to do things as best as possible.Another characteristic that we all share, and which I consider very important, is the sense of humor. "Don't ever mistake silence for ignorance, calmness for acceptance, or kindness for weakness." 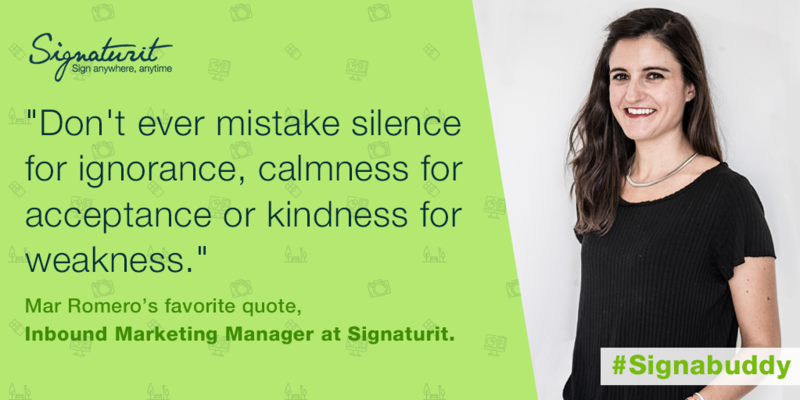 Inbound Marketing Manager at Signaturit.